Justification is God’s declaration that sinners are made right with him through faith in Christ, whose life, death, and resurrection provide forgiveness and the righteousness God desires of his people. This doctrine of justification as an alien, imputed righteousness has been under attack for several years. 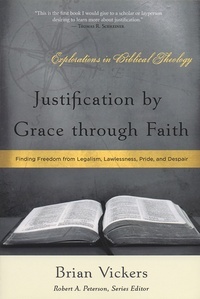 Brian Vickers’ biblical theology of justification traces how the doctrine unfolds in Scripture, showing that in Christ, God provides everything needed for sinners to be made right with him. Whether struggling with legalism, lawlessness, pride, or despair, a biblical view of justification will lead us away from ourselves to the God who accepts us fully in Christ.